"Sun, Surf and Racialist Music," we came expecting a brilliant weekend out and we were not let down. 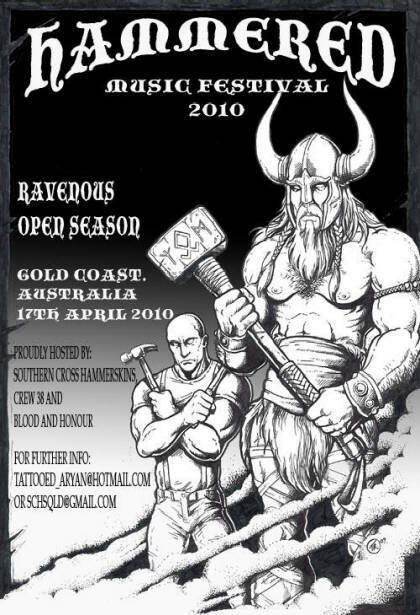 Promoted for about 9 months, Hammered on the Gold Coast was the first, and most highly anticipated racialist event that the sunshine state had offered in years. A merry crew of Victorians, including myself, flew in to sunny Coolangatta airport on Friday with much enthusiasm. Arriving at our motel was a joy in itself - finally being with our comrades; both new faces and old friends is always a privilege. To meet and catch up with such great people is a major highlight of Blood and Honour events. The Zionist controlled press had published reports in several newspapers that hundreds of skinheads would be converging on the multiracial Gold Coast to cause havoc and spread hate. We expected these lies from the usual suspects and wouldn't let that spoil the occasion. After a day enjoying ourselves and many a brew, it was time for a well deserved feed. Destination Ashmore, we found ourselves at a "surf and turf" restaurant frequented by never ending mobs of Asian tourists. The meals were pricey but definitely worth it, very few managed to eat their entire plate - much to the joy of one hungry, no, ravenous skinhead who enjoyed a nibble of everything. Back home for more beverages and chinwagging that continued well in to the next morning. For most of us, Saturday morning came with barely a few hours sleep. Some went to find a hot breakfast, only to find the ridiculous, yet hilarious front page headline, "Steak with a Side of Hate" (describing our dinner the previous night). Behind every lie and slander is a bit of truth and the journo admitted the heavily-tattooed folks in attendance were all polite and well behaved. The gig couldn't come soon enough but eventually we were on our way. 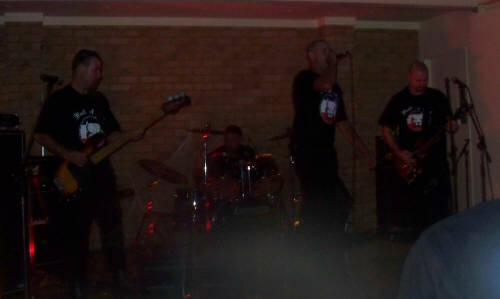 As always with gigs, the venue was undisclosed until the organisers were ready for us. By the time everybody had arrived at the venue, our numbers had swelled, easily 80 to 100 in attendance and we knew this night would be one to remember. SCHS had organised a large venue for us, with plenty of space for everybody to enjoy themselves. A bit of time given for the first band to get ready and the night began. First up was Full of H8, these brutal Vikings put on a hammering first ever gig and it will be great to see them again. They opened the night up with the Skrewdriver classic "Showdown" and with everybody knowing the words, it was a terrific start to the night. They really set the night up to be a rocking experience and everybody was pumped to see the next set. Open Season was next to grace the stage and bloody oath they did. I'd never seen them before and I'm hooked. Songs including Frontline Fighters and a cover of ACAB got the crowd pumping. The police pressure on organisers to cancel the gig was not forgotten! The band had really made an outstanding effort, considering due to last minute unforeseen circumstances, Ravenous' Hot Rod and Cranky needed to learn the whole set in just 3 hours. Up next came a full set from the mighty Ravenous. In hindsight, I don't remember much of this set but that's because it rocked! A few sore bodies the next morning was well worth it. Free was a crowd favourite of course, with many a right arm salute and sing along, along with covers We Play For You and 88 Rock'n'Roll Band. Invader was also dedicated to one of the Geelong lads. Unfortunately, prior to the Hammered festival, a great man that spent his life fighting for White rights in South Africa was murdered by black thugs. 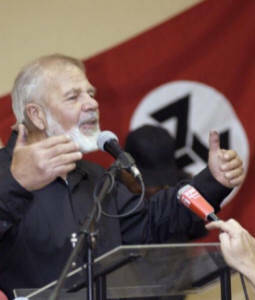 At this point in the night, a minutes silence was had to reflect upon Eugene Terre'Blanche of the AWB and his fight for white survival. RIP brother! The next band was much anticipated and with an exciting new line up. Death's Head only offered the Hammered crowd a little teaser of what they have installed for Septembers ISD. The three songs played were certainly wild! The new guitarist and of course Jesse himself rocked out that hall and made the ladies swoon until the knickers were flying up on stage (inside joke, you had to be there). Not long after Death's Head had finished, it was time to pack up the venue and head back home. The whole event was filmed and rumours suggest that a DVD will be available soon! An absolutely awesome night was had by all and it had drawn the finest people, especially the terrific D and Y from Rocky and without the New Zealanders, it just wouldn't be the same. That wraps up another wild night of musical resistance against our enemies. I'd once again like to thank SCHS (especially Tattooed Aryan), Crew 38 and 28 Queensland for all their hard work and determination in making sure this gig went off smoothly and as successfully as it did. I hope another event in Queensland is on the cards for the future! The following day it was time to head back home; we said our goodbyes to our comrades and left for the airport. While waiting at the airport, a lovely woman working as a cleaner came up to us for a chat and congratulated us on a job well done. 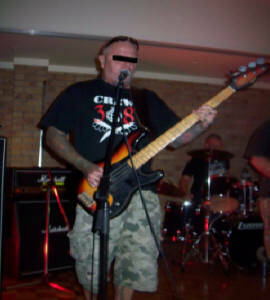 These gigs aren't just about partying and music; we really are the independent voice of the White race around the world.